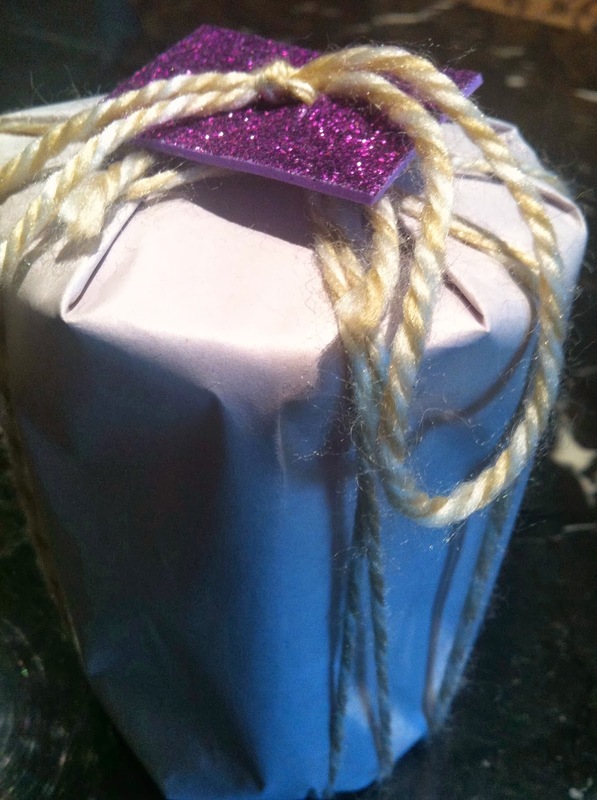 I adore Butchers paper for gift wrapping. I think elsewhere in the world, it may be referred to as Carpenters paper. It's a blank canvas that does not limit you to snowflakes for Christmas, pirates for boys birthdays, roses for Mothers Day and golf clubs for Fathers Day. It's also sold by weight..isn't that odd? We paint it, potato stamp it, write French greetings on it, or paste favourite photo memories on it to tailor it to our recipient. But here's our favourite way to use it. Plain, simple and yet so effective. 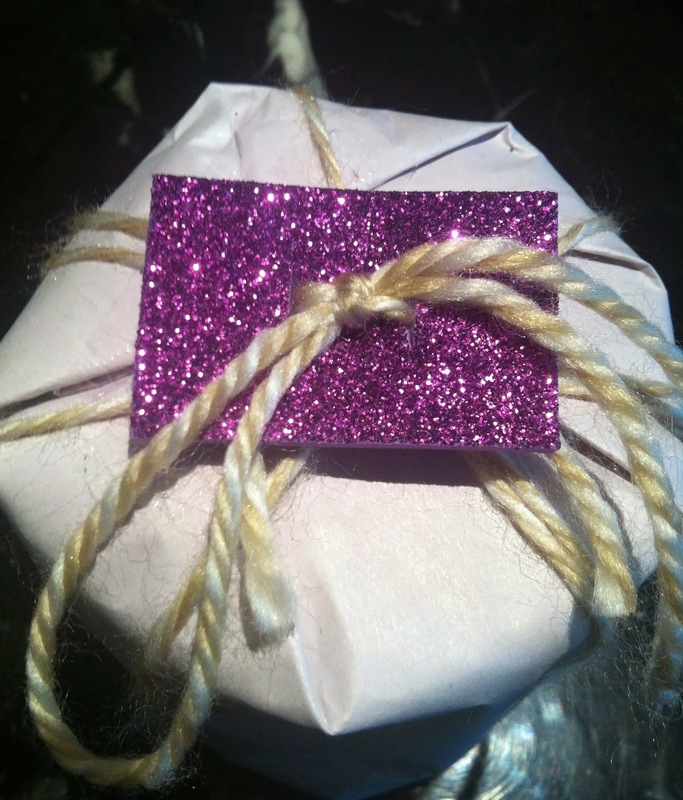 Wrap your gift in plain Butchers paper. This one was a chunky scented candle, and the other thing I love about the Butchers paper is that it's thinner and more pliable, yet sturdier than flimsy gift wrap for oddly shaped gifts. Now we've discovered this brilliant stuff at our local dollar store called Eva Foam. It's thicker than craft cardboard, more pliable as it is indeed a sort of foam, and super glittery, thus saving us the task of glittering it ourselves. Lacking Eva Foam in your area, of course use anything from glittered craft cardboard, to Victoriana or designer label images pasted to cardstock. Cut a pleasing shape from your foam or cardstock, be it a simple rectangle as pictured, or something more complex like a star, heart, favourite animal or car, or designer logo. I've done some very special designer ones which I'll share with you tomorrow, so stay tuned. Now simple bend your glittered shape gently in half, avoiding creasing it overly much, and cut two little tiny slits, much as you would imagine buttonholes to sit, in your shape. These are to thread your yarn or ribbon through. Tie your yarn or ribbon around your gift (we use a couple of rounds to make it look generous), and tie firmly in a knot on top of the gift. Now thread the ends of your yarn, up through the slits in your glittered shape, seat in firmly on top of the knot and tie in a bow. Ta-da! Very pretty and stylish gift embellishments for the teeniest, tiniest price of a fraction of a cent. We estimate you'd get at least one hundred glittery embellishments out of one sheet of glittered foam or cardboard and one ball of yarn.